In 2017, the Moto app team updated the phone to be responsive and personal. If you haven’t registered the Moto products, it will reach out to you through contextual messages. It delivers daily suggestions about how to free up phone memory and optimize battery performance. It intuitively saves your home and work locations while learning more about your location. I was the design lead and presented works to gain buy‐in from internal stakeholders and many other Motorola teams throughout the project life cycle. I worked on the product between January 2017 to October 2017. The product was launched in October 2017. A smart notification strategy sends suggestions not based on time, but on contextual triggers. This requires not only basic instrumentation, but also new ways to understand contextual moments such as sleep patterns, personal routines, locations, and other contextual data that have been studied in experiments. In 2017, Motorola ended their exclusive partnership with Verizon so we were able to move the Moto app to the Home screen so the user could identify the branded product out-of-box all the way to the in-app experience. The new feature helps the user to free up space on their phone and remove duplicate photos. It also monitors battery performance to improve/resolve battery drainage issues. “Everyday tasks made easy: Tailor your experience with Moto's helpful tools.” is the principle of Moto app. I focused on the mission that I believed in. It can also be incredibly helpful to bring my creativity and energy towards that goal. I knew the blockers and pushed the boundaries in order to succeed. I worked with designers and developers in São Paulo, Beijing and Chicago. I enjoyed connecting the dots by understanding issues, discussing ideas and coming up with options for internal discussion and external user research. I took ownership by proactively discussing with the team and rapidly made new iterations to look over. 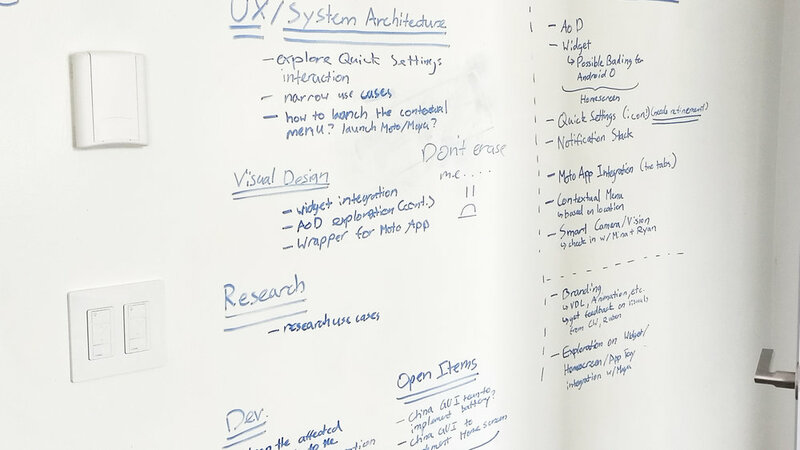 As a UX, I do whatever I can to ensure the outcome that I envision. I proactively pitch ideas to engineers about my approach and show my wireframes as early as possible. It is important to discuss the product updates and gather the team’s awareness. I worked with a design researcher to understand the challenges users encountered when trying to get through their day. Also, we wanted to capture pain points and desires for what would make the user’s life easier. In order to present the desires and pain points to senior leadership, we tied potential opportunities from use cases. The participants created context journals to capture moments where they tried to accomplish something but struggled. Based on the findings, we discovered users want PEACE OF MIND. People are overwhelmed with how much they need to remember and everything they need to do. The consequences of not doing what is needed is stressful. Users want to know the system won't fail. By solving the user’s needs, Moto can provide peace of mind. Handle my regular actions for me. 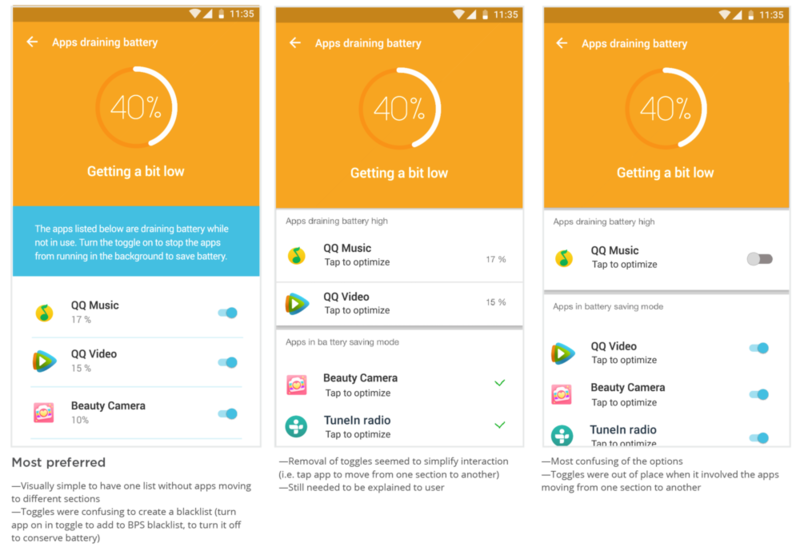 Make it easier to share information between battery and storage performance. Give me relevant (and accurate) information at the appropriate time. Help me get to my routine destination seamlessly. Help schedule my appointments with friends and family. Make it easier to share, organize, prioritize, digest, and digitize information. 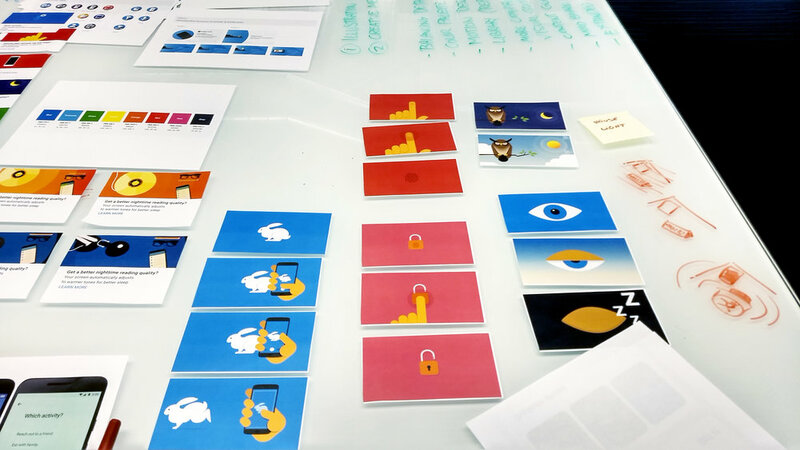 Given the findings, I worked with the visual designer to create storyboards based on external user insights. The goal is to explore and obtain feedback on various use cases. We want to identify which ones would be most compelling to users and to understand what the users look for in features. Working with the researcher to run the storyboards and card sorting into categories (interesting, maybe interesting, not interesting), the scrum team can have a reference with which to schedule the work list on each sprint. Users don’t like to read intro screens. Many users told us that if they were not in a research session, they would not be reading the screens at all. So the team decided to keep the value prop screens as short as possible and add visuals to better illustrate what the user can do. Focus on “Moto Suggestions” and “Moto Experiences” in the value prop screens, because that aligns with the tabs in the app. Before 2017, the user came to Moto app as a place to set up the device experience. Once the user completes customization, they typically don’t return to the app. Based on the goal “Increase brand awareness”, we want to add new features and update the look and feel of Moto app. We create engagements to bring the user’s attentions to the app. It is our main assignment to change the architecture system. We found the tab system is the preferred option and is aligned with the suggestion from Google Material Design Guideline. We know the system needs more visual design explorations because some testers felt tabs are too hidden and are easily missed. None of the users had ever opened their current Moto app on their phone before the session. It was unfortunate to see many users not fully experiencing their device. There is an opportunity to track discovery notifications and understand what the users prefer. The visual designer, researcher and I worked closely to iterate the design based on research feedback. When we focused on the storage management main screen, the suggestions card seemed less helpful than users ultimately found it to be. Users initially felt their phone already had this capability, but when they opened the card they were excited by the options. Many identified that they have to do this manually today, and would be interested in having their phone surface these things for them automatically. I felt the card helped the users better understand the functionality of this experience. During the research, we found the users want to know WHY something is being proposed to them. Also, clearly understanding the value of the experience is essential for users. Simple and consistent verbiage that aligns with what users see in other parts of the UI is preferred. The team and I tried to understand “What is the user’s reaction to variations in the UI to remove similar photos”? Through the study below, we found that users want to simply scan the photos and take action quickly. Keeping photos auto-expanded helps communicate to users that the pictures are being stored in other folders on their device. My solutions attempt to highlight device management challenges that frustrate users. Device management is a long term experience that affects the way the users interact with storage and battery management. Under the details screen, the “Delete” button was for removing duplicate photos was easily missed. Once users scrolled down the page and began selecting photos, the header disappeared. After a few discussions, we decided to either lock the header in place or put the delete icon in a more prominent place so the user can find it quickly once their selections are made. The power saving options were very confusing for users. They did not understand why they needed to “turn the toggle on, so the app would be turned off in the background.” It seemed very unintuitive though the use case itself was appealing. I felt dissatisfied when testers confused the screens. I created clearer designs for “how to add apps to a blacklist” by focusing on allowing the user to quickly add or remove apps in a single screen. The research sessions allowed me to design battery optimization features that could have different levels of communicability depending on the copy and visual design.